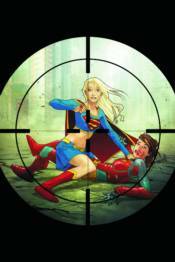 Written by STERLING GATES & GREG RUCKA � Art by JAMAL IGLE & others � Cover by JOSHUA MIDDLETON Supergirl and Flamebird must work together to track down their father's assassin - Reactron! But these childhood friends find themselves at each other's throats in these stories from SUPERGIRL #43 and 45-47, ACTION COMICS #881-882 and SUPERMAN SECRET FILES 2009 #1. NEW SUPERMAN #01: MADE IN CHINA (REBIRTH) SOFTCOVER NEW TEEN TITANS OMNIBUS VOL.02 HARDCOVER NEW ED. SUPERGIRL: WHO IS SUPERWOMAN? SUPERGIRL: WHO IS SUPERWOMAN?